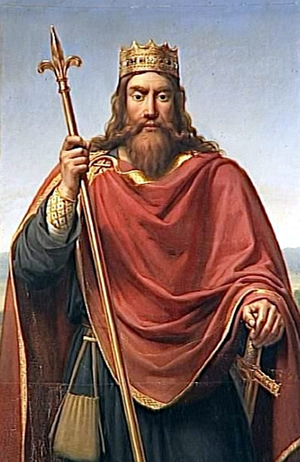 he Franks, under king Clovis, defeated the Romans in Gaul on the Lower Rhine in 486. In the years up until 534 they defeated the Alemanni, Visigoths, Thuringii and Burgundians and finally dominated a large part of Central Europe. Around the same time the Jutes, Frisians, Angles and Saxons from northern Germany and today’s Denmark invaded Britain and occupied large parts of that country. The Langobards2 (Lombards), part of the Suebi tribe, who lived on the Lower Elbe about 166 AD, invaded the Roman Empire at the beginning of the Markomannic3 wars and occupied the territory on the middle Danube from 485. A Group moved to Moravia (now Czech Republic) around 490 AD, and at the beginning of the 6th Century they moved to Pannonia (today’s eastern Austria). In 568, together with other ethnic groups including Saxons, Gepids and Romans, the Longobards invaded northern Italy, where they established the Kingdom of the Longobards. 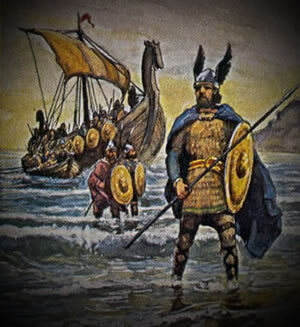 The great migrations in Europe ended during the 8th to 10th centuries due to the Viking4 raids. In East Central Europe a Slavic migration was triggered by Germanic migrations to the West, which led to the extension of the Slavic settlements up to the Elbe River. The German Ostsiedlung had begun. 2 Langobards ("men with long beards" also called Winniler) = Elbe Germanic tribe (part of the Suebi), who settled at the time of the birth of Christ onto the lower Elbe. After hiking and military campaigns ( today's northern and eastern Germany) they occupied areas north of Noricum by 490. Langobards were first mentioned in 488 in the Land of Rugii (Lower Austria). In 508/509 they defeated the Heruli and took over their kingdom on the Morava in today's south of Slovakia. In the 6th Century they extended their settlements to Pannonia (today’s eastern Austria) to the Sava, destroyed the kingdom of the Gepids in 567 in today's Transylvania and in 568, under King Alboin, they broke into the then Byzantine Italy. The Langobards kingdom with its capital at Pavia encompassed northern Italy and parts of central and southern Italy. Charlemagne, king of the Frankish Empire, conquered Pavia in 774 and crowned himself king of the Langobards. 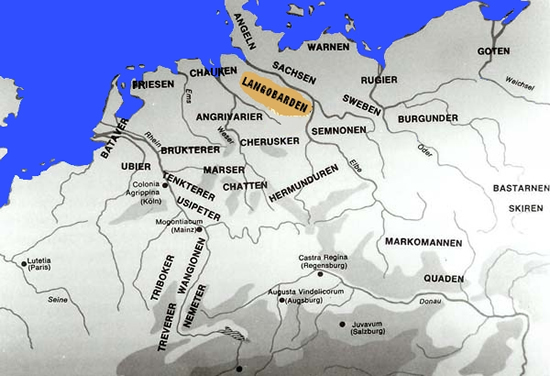 In 951 the territory of the Langobards was connected by Otto I, King of East Frank Empire (Ostfrankenreich), with the Holy Roman Empire of the German Nation. The Duchies of Benevento, Capua and Salerno in the south initially remained independent, until the 11th Century when they came under Norman rule. 3 Marcomanni (in German: Markomannen, the plural of Markomann; it is a composed substantive of Mark (antique word for border area) and Mann (man); the 'o' between the two words can be considered like a glue for a easier pronunciation; so the significant is: men who lives in the border area) were a large Germanic group of the Suevi tribe, probably expelled from the Elbe at the beginning of the 1st century BC. They then settled on the Main River, in the current Franconia and displaced the indigenous Celts. During Caesar's time, they were in the north-eastern half of the Kingdom of Bavaria. They had been defeated by the Romans in 9 BC and together with the Quadi under King Maroboduus they moved to Bohemia, to the land of the Boii (Celtic tribe) which penetrated from Gaul around 400 BC to an area in Nothern Italy (capital Bononia, today Bologna) or in Bohemia (Boiohaemum named after him), situated in the north of the Danube, where Maroboduus, in alliance with other Germanic tribes established a great Germanic Empire, which was perceived by the Roman Emperor Augustus as a potential threat to Rome. In 19 AD, the Marcomanni, came under Roman influence and were a Roman client state for 30 years. The pressure of other Germanic tribes, social and economic changes, and the weakness of the defense of the Roman Empire led to the Marcomannic wars, which lasted, with interruptions from 166 to 180 AD. In 433 the Marcomanni, living in Pannonia, came under the rule of the Huns. In the 6th century, they immigrated to Bavaria and their name is gradually lost. From then on, it appeared under the name of Bavaria, a name that they had already brought from their Bohemian homeland, where they were called 'Vaiwarier', i.e. residents of Baiheim in Bohemia. 3 Vikings = The name for the inhabitants of Norway, who, in the 9th Century, separated from their "brothers" the Normans, and then populated Iceland, Greenland and North America.